Cecilia Krieger was born in Jaslo, Poland (formerly Austria) in 1894. After studying mathematics and physics for one year at the University of Vienna, she entered the University of Toronto in 1920 (despite knowing very little English), receiving her B.A degree in 1924, her M.A. in 1925, and her Ph.D. in 1930 under the direction of W. J. Webber. Her graduate work included courses in Modular Elliptic Functions from Jacques Chapelon, Minimum Principles of Mechanics from J.L. Synge, Theory of Sets from Samuel Beatty, Theory of Numbers from J.C. Fields, and Theory of Functions from Webber. Her thesis was "On the summability of trigonometric series with localized properties--on Fourier constants and convergence factors of double Fourier series." This was published in two parts in the Transactions of the Royal Society of Canada, in 1928 and 1930, respectively. Krieger was the first woman, and the third person overall, to earn a mathematics doctorate from a Canadian University. She had been appointed an instructor in mathematics at Toronto in 1928, and became a lecturer in mathematics and physics in 1931 after spending some time at Göttingen upon completion of her degree. After 12 years she was promoted to assistant professor at the University of Toronto and taught there at that rank until her retirement in 1962. She is known for her translation of Sierpinski's Introduction to General Topology (1934) [Cover page] and General Topology (1952). 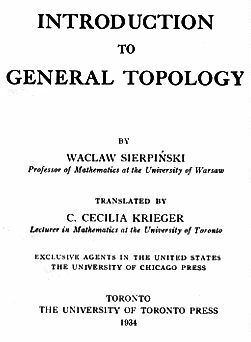 In the 1934 translation Krieger also included an appendix that contained some of the ideas and results from Sierpinski's text on transfinite numbers that were used in the topology book. Krieger was very active at the University of Toronto, both in the Department of Mathematics and in the Engineering Department, where she worked closely with graduate students. Cathleen Morawetz attributes her original interest in advanced mathematics and decision to pursue a mathematical career to Krieger's encouragement and support. She was also an active participant in the Canadian Association of University Women. In 1953 Krieger married Dr. Zygmunt Dunaij. She officially retired from the University of Toronto in 1962, but continued teaching there for 5 more years. After her husband's death in 1968, she taught at Upper Canada College until her own death in 1974. It is a very special honor to give the Krieger-Nelson lecture and to receive this award. In the name of all women in mathematics I would like to thank the Canadian Mathematical Society for creating this award. Now that I am standing here I feel especially grateful and thoughtful. I did not know the Nelson of the lecture title, so I cannot speak of her, although I heard a little of her at the first Krieger-Nelson Lecture. But probably I knew a good deal longer than anyone else here, Cecilia Krieger. Born probably in the late nineties in Poland she received her B.A. in Mathematics in Toronto in 1924 and completed a Ph.D. with Webber in 1930. And now I come to my first memory of her from, I think, Christmas 1930. My father was her colleague in mathematics at the University of Toronto. We had just returned to Canada from Ireland and Miss Krieger, as she was known to us children, took my sister and me to the pantomime. I hope I did not say so at the time, but I thought its lack of plot was very stupid (the pantomime in Ireland suffered the same defect). But there was no question that Miss Krieger was the kindest person I had ever met, and I probably did not say that either. Cecilia Krieger had come to Canada with her mother and sisters to escape the persecution of Jews in Poland. She spent her life in Toronto teaching mathematics. Her principal mathematical contribution was the translation of the two books on topology by Sierpinski. For many students of mathematics, she was the source of friendship and encouragement in every way. Her Sunday teas for students were famous for their sociability, intellectual conversation, terrific cakes and every now and then "matches"; for example, she introduced my sister to the man who became her husband. I remember learning that she was also the sole support for many years of her mother and a handicapped sister. It must be added that she lived at a time when the prejudice against women meant that she was for over twenty years not promoted from her position as lecturer. For my career she played a fundamental role. I have told this story before but I will tell it again. I would not be standing here but for Cecilia Krieger. I was in my final year at U of T. World War II had almost ended and there had been a call for teachers to go to India. The idea of living in an exotic country appealed to me and since I did not have any other ideas, that is what I was thinking of doing. But I ran into Miss Krieger one day as I crossed the campus and she asked me what my plans were. So I told her. She was horrified. "Why aren't you going to graduate school?" "I haven't the money," I said. "Easily fixed," said Miss Krieger. She assured me that I could receive the Junior Fellowship of the Canadian Association of University Women. So before I knew it I was applying to graduate school and Miss Krieger (who was of course on the Fellowship Committee of the C.A.U.W.--I think even the Chair) had delivered. I know I was not the only one who benefited form her energetic help, but her actions put me on the road. I wavered sometimes and I'm not sure I was always glad but I certainly am now. Anand, Kailash K. and Anita K. Anand. "Cypra Cecilia Krieger and the Human Side of Mathematics," in Despite the Odds: Essays on Canadian Women and Science, Marianne Gosztonyi Ainley, Editor, Vehicule Press 1990. Newsletter of the Association for Women in Mathematics, Vol 27, No. 6 (November-December 1997), 13-14.
de B. Robinson, G. "Biography, Cecilia Krieger-Dunaij," Notes of Canadian Mathematical Congress, January 1975, reprinted in the Newsletter of the Association for Women in Mathematics, 5(3), April 1975.